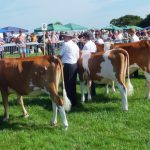 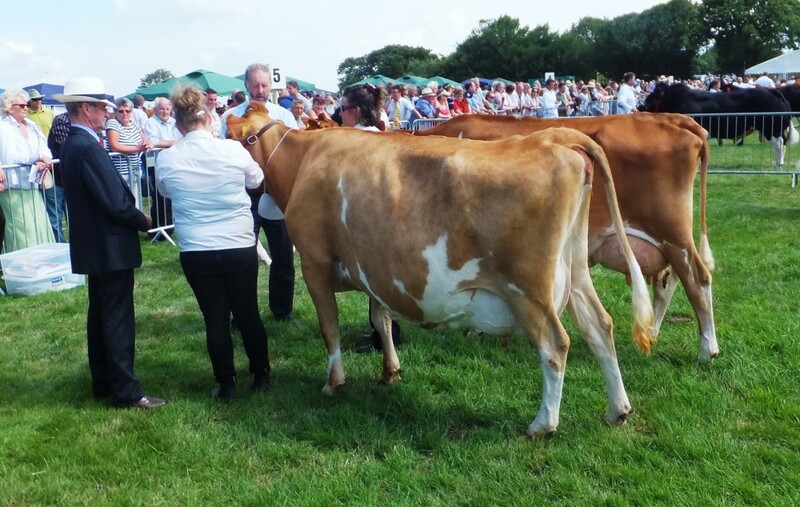 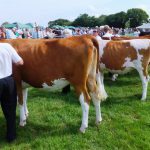 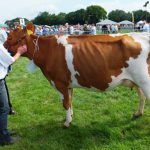 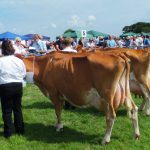 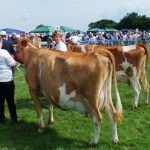 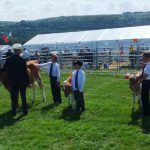 17 Guernseys from 6 exhibitors were the most competitive section in the Dairy Lines and only the “Orange Elephants” aka South Devons had more animals catalogued amongst the beef breeds. 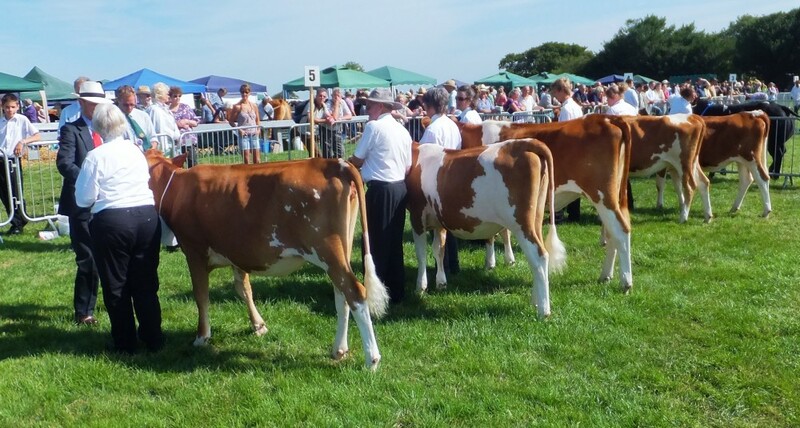 As at every show this season it has been the heifer classes that were strongest with 6 maiden heifers prpviding the first class for Judge Terry Hamlin to place, the two Trewey heifers bought as calves by Brian and Sheila Adams and so well grown that despite giving away six months in age to their peers and Trewey Prince Poppy 36 was again placed first with Trewey Jackie 52 in second place and Greensfield Lady Jay in third place, with the Carpenter’s Fairfield Bonnie in fourth place , with Jon White’s Webbery heifers in fifth and sixth place. 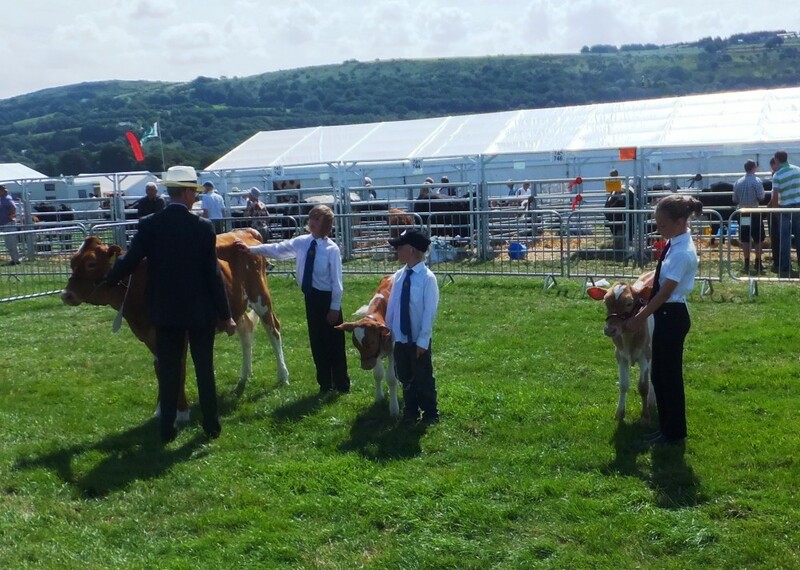 5 In calf heifers saw Hamps Valley Annabelle 7 continue to dominate, and she gets as much approval from other breeds asa our own, and it was Wiltown Claudia the Mint daughter of the first Addington Fund heifer who was bridesmaid for the 5th time this season, Fairfield Maria by Aber Silver Flash was third, with Greensfield J O Sudeley in 4th place, with Kingwell Brandy Salt in 5th place. 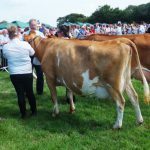 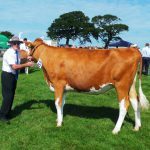 Greensfield Iceberg June Star the Honiton Champion from last week was again unopposed but this heifer will take some beating and is a “cowmaker”. 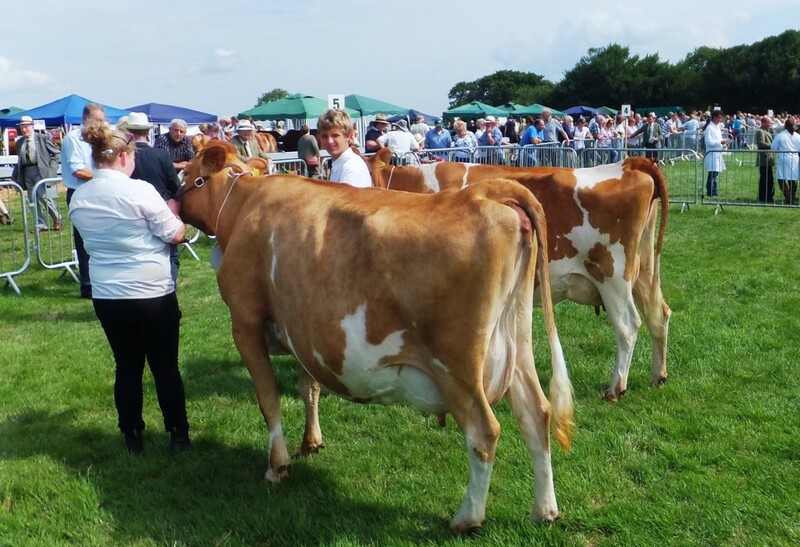 Two in calf cows saw Greensfields Heros Star a fifth calver having two much depth and frame with a good wearing udder but the runner up Kingwell Rum Savoye is a really good young cow in her own right. 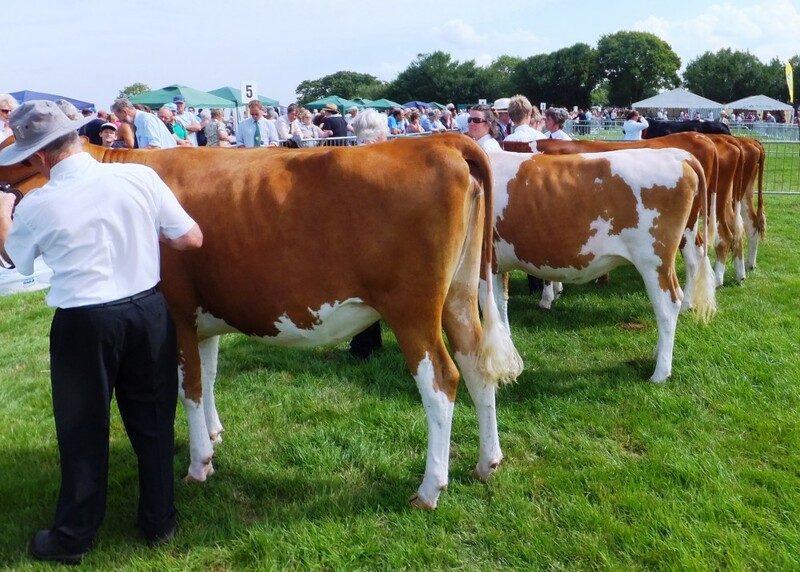 Two milk cows saw Trevider Hercules Linnette from the Carpenter’s having been Champion in May at Devon County and more recently at Totnes was looking well a credit to Chris and Louise, and she had the beating of Greensfield Icy Lady a grandaughter of the fabulous Greensfield Pink Lady Ex 91 who recently calved her 10th calf. 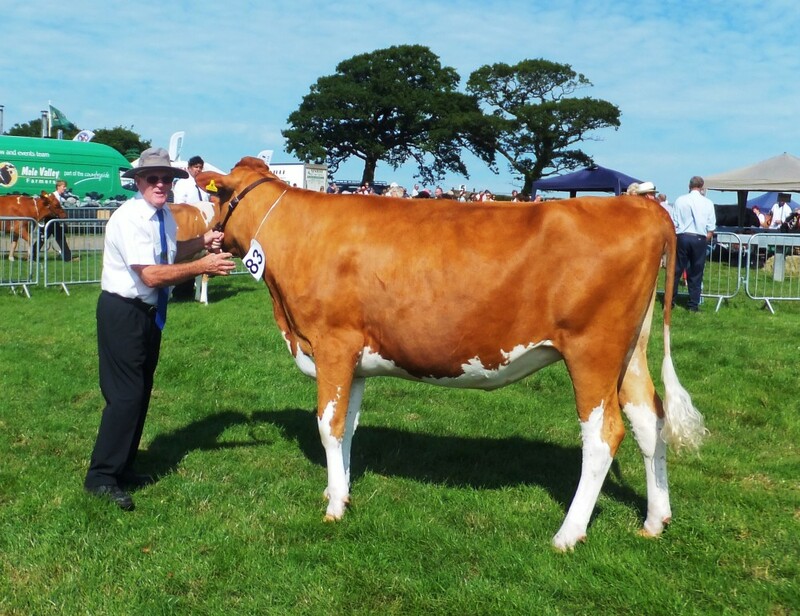 Terry Hamlin surprised some with his choice of Champion but his reasons explained that he felt that his Champion Greensfield Heros Star had had 5 calves and looked good for another 5 whilst the contenders, Linnette and Junes Star had still to prove their wearability. 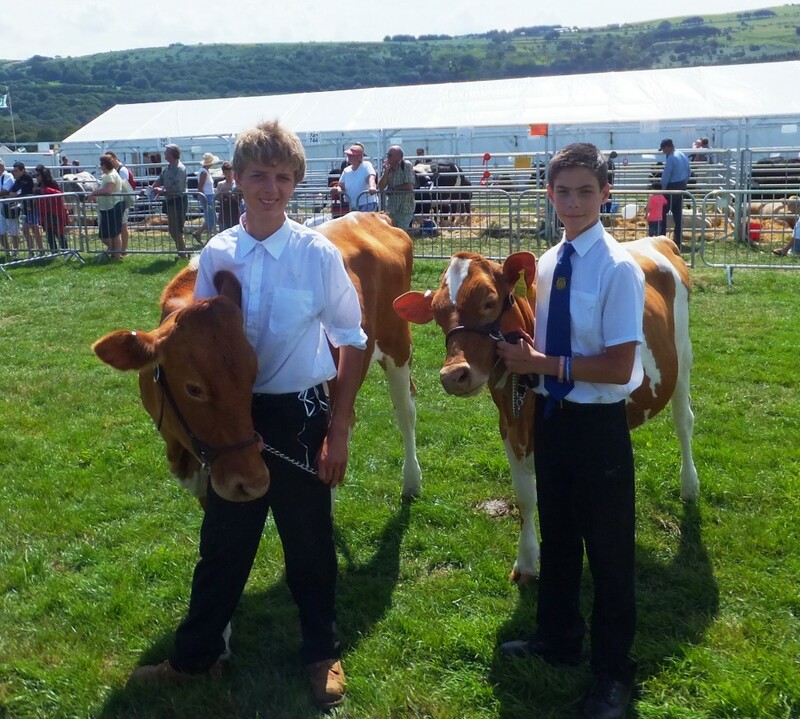 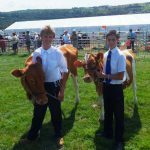 Okehampton Show has a section for Guernsey Junior Handlers with Classes for Under 12 and Under 16 and these classes were created by the enthusiasm of the Late June Rockett, and it was good to see Abi Marshall (Les Rockett’s step daughter) winning the first class with a very sweet Kenvin calf, with Oliver Carpenter with Novak Rosie in second place with Imogen a new recruit to the Curry Rivel stable in third place. 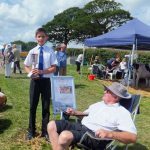 Two young men contested the second class and Harry Crowter from Curry Rivel was placed first with George Radcliffe placed second, George had impressed me at Honiton last week as in the stifling heat he never stopped work carrying water for the combined Greensfield/Kingwell teams but even offered to water the Adams team as well. 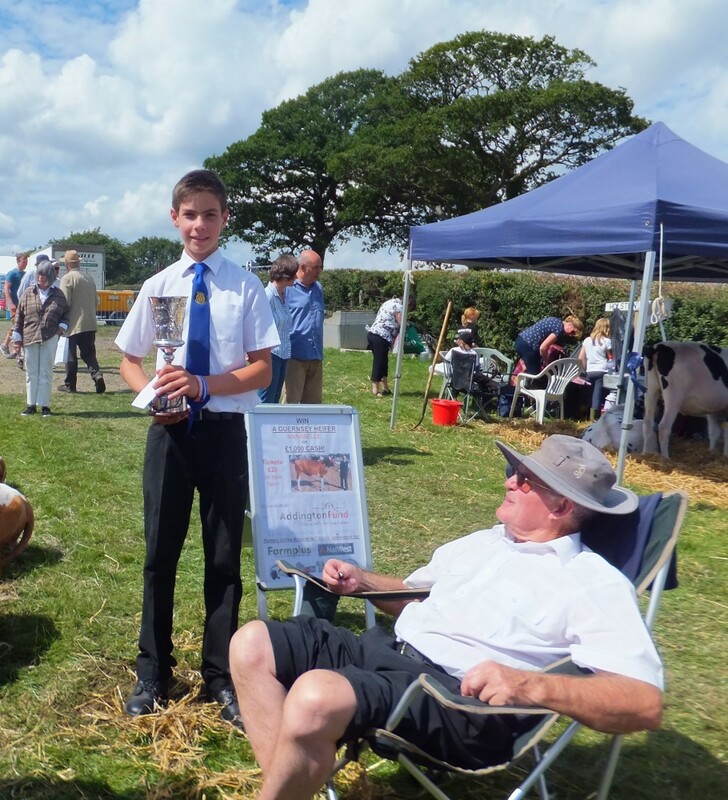 Harry was judged as Champion and won the fabulous Cary Barnard Trophy, whose previous winners have been Ian Rowe (3 times_ Kelly Marks, and Abi Marshall , he was a worth successor. 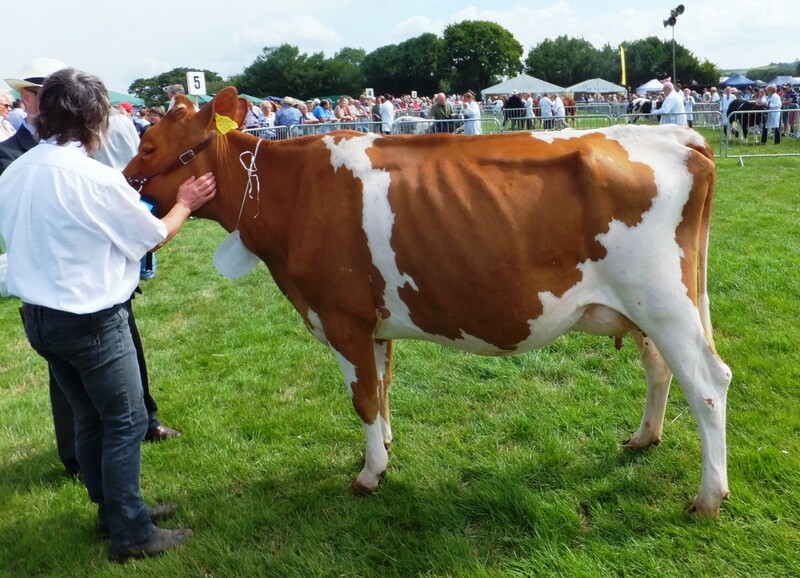 Tickets for The Addington Fund Heifer are selling well (over two thousand pounds raised so far) but it was good to see leading Ayrshire and Holstein breeders buying tickets because they want the chance to show her next year. 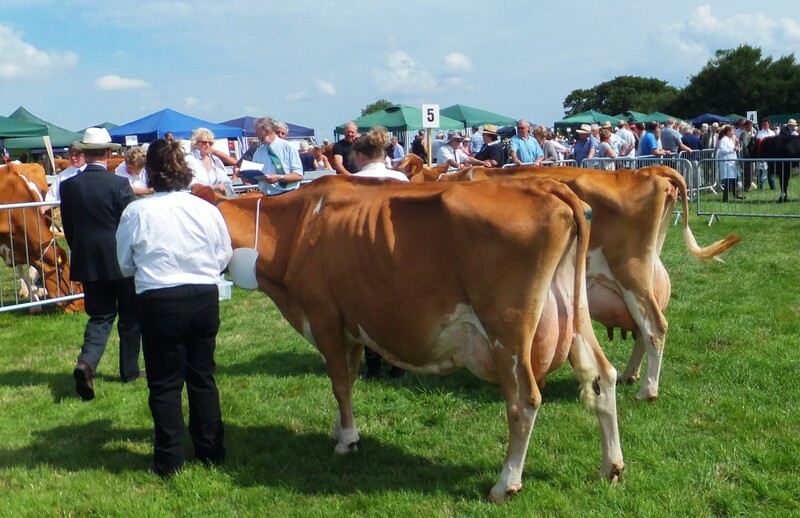 The Orange Elephant reference in the opening paragraph is because one South Devon breeder has started milking his cows to produce Ice Cream sold under the Orange Elephant brand, for many years milk from South Devon cows was accepted as Channel Island because of the high percent butterfat.